Do you believe that food and pharmaceutical producers are as cautious as they should be? Do you think these manufacturers truly have our best interests’ at heart? Could we go so far as to agree, that in our country, there is an inherent disconnect between a mindset that focuses on “Substances that have not been proven safe,” versus, “Substances that have not been proven dangerous?” Finally, why the heck do our leaders choose to approve all manner of things, “not proven dangerous” – instead of conducting ethical and sensible safety research to determine what potentially harmful effects may exist? 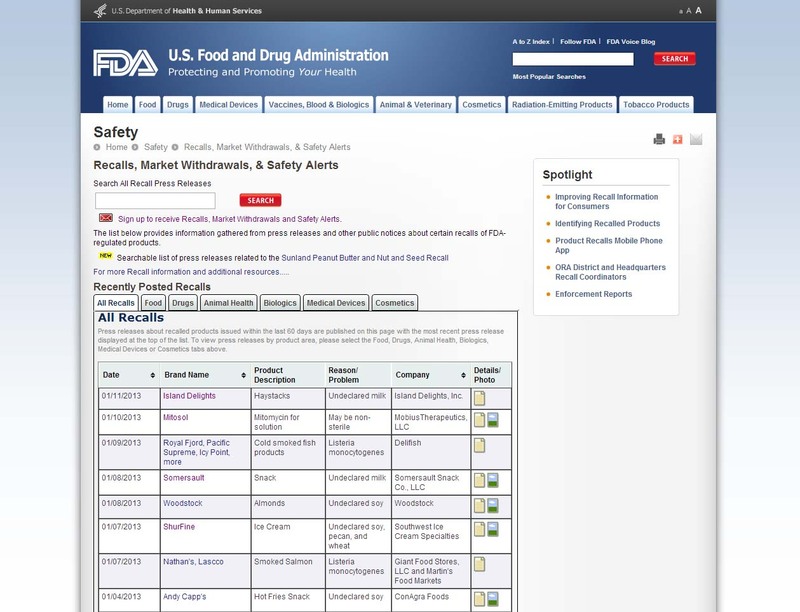 Check out the FDA Recall page for an enlightening overview of the weekly mistakes our corporate leaders make in regards to the production of medicines, biological products, foods, devices, and more. You’ll find foods recalled due to undeclared soy, milk, peanuts, and Listeria monocytogenes. If you dig deep enough, you’ll even find 568,000 cocoa-latte hot drink makers, produced by Focus Electronics in under the West Bend and Back to Basics brands in distribution that possess a small brass metal bushing in the liquid containing vessel that may leach lead. (That’s right, LEAD in a latte machine!) You’ll find the presence of glass particulates nationwide within several lots of Hospira, Inc. brand Epinephrine injections (Check ‘em if you’ve got ‘em people. Nobody wants glass in their Epi-Pen!). You’ll even find Red Blood Cells (Leukocytes Reduced), which in this reference, is a blood product recalled because it was collected from a donor who was at risk for variant Creutzfeldt-Jakob disease. vCJD is known as a rare, fatal neurodegenerative condition and is linked to the consumption of beef contaminated with a form of Bovine Spongiform Encephalophathy (BSE). I think this is pretty scary stuff. I suppose the good news is that these errors were caught and recalls were issued. However, this also reminds me of how our interests’ are not often considered before profit. I loathe recalls for foods with undeclared allergens. As the mother of a child with food allergies and intolerances, this is a huge ordeal. For those lucky enough to not worry about such things; please consider the severe consequences that follow consumption of such a food for a child with an anaphylaxis. All too often, it can be quite scary living in today’s world with food allergies. (For an even better picture of the complexity of managing food allergies, take a look at this helpful cheatsheet developed to help police questionable ingredients for a wide range of allergens.) For my son, accidental ingestion of milk proteins means intestinal bleeding, inflammation, and a weakened immune system. I’m grateful that, thus far, this is as severe as it gets for us. For one of my son’s classmates, even encountering peanuts on the breath of an individual within two hours of consumption can send him into anaphylaxis resulting in an Epi-Pen injection, trip to ER, and scary hours managing the reaction. Undeclared allergens should not be such prevalent oopsies in our food industry, and yet, in many cases they are just that. My next argument on this matter is in understanding why we rarely hear about so many recalls through popular media. Did you hear about the massive peanut recall due to Salmonella contamination last year? Did your local media primarily focus on Sunland, or did it disclose the rolling list of brands that were also at risk because they used these same peanuts to produce their products? Mine didn’t mention anything beyond Sunland. This contamination affected hundreds of peanut-containing products that sourced their peanuts from the Sunland-selected growers in Latin America? Overall this story received a teeny-weeny bit of air-time, but most of my friends didn’t hear of the vastness of Sunland-sourced peanut contamination. See the full list of at-risk products here. I’m certain you’ll recognize a few of the popular brands: Archer Farms (Target), Earth Balance (OMG…this was our favorite), Harry & David (chuck it out of those holiday gift baskets), Trader Joe’s Organic, Justin’s peanut butter cups (Yikes, our milk-free, gluten-free candy of choice)! Have you heard about the undeclared milk in Island Delight’s coconut haystack candy (1/11/13) or Somersault Snack Company’s cinnamon crunch (1/8/13)? What about the undeclared soy, pecan, and wheat in ShurFine’s ice cream (1/7/13)? I could continue to go on, but I’m sure you get the picture here and this is just in the past week! Do you still feel safe? Or, like me, does this make you feel a little betrayed, more distrustful, even somewhat paranoid?! I agree with thousands of mothers, just like me, that this information is not something that anyone really wishes to hear or learn. I’ve spent lots of time questioning my own blissful ignorance and guilt as my understanding of food and drug regulation changed and crystallized. The hard truth is that once you learn about so much of this, it’s impossible to unlearn it. We must demand more from our food suppliers and this starts with our own personal choices. It may not be possible to do everything all at once, but we can begin with baby steps to gain more intelligence and awareness of the foods we serve our families. It’s not just about GMOs, it’s about the entire system and it how it negatively affects our food supply, the pharmaceutical industry, numerous beauty products, and even our beloved pets. Make a choice to live more informed, today! Watch this short video featuring fellow Mom-hero Robyn O’Brien explain how we can each begin making a difference by doing at least one thing to further the better foods movement!